[Maher]: Who’s dying? Come on! Pick it up! Pick it up! [Lopez]: Phil! Big Papa, please! I need 15! [Maher]: What’s the problem here? It’s hot—it’s hot! The script is from Enough (2002) by English director Michael Apted, whose movies include Nell (1994) and Gorillas in the Mist (1988). Actor Christopher Maher is playing a cook for the very first time. Twilight at candle-lit restaurant in high mountain valley. Band plays southwestern tunes in background. Camera zooms in slowly to lone standing figure. Slow close-up of CHEF/restaurateur [Christopher Maher]. In white shirt, black pants, tinted glasses, CHEF moves around patio, greeting guests. Camera follows CHEF inside. More candles light wooden-beamed ceiling of quiet adobe room. CHEF walks over to couple at low table, presents plate of perfectly grilled shrimp, plump crab cakes and spicy pineapple relish. This time the script is Maher’s own, from his four-diamond restaurant Momentitos de la Vida (“Little Moments of Life”) in Taos, New Mexico. Christopher Maher—chef, restaurateur and Hollywood actor—was born in Egypt as Maher Butros. Although his family left Alexandria when he was nine years old, his face lights at the mere mention of his native country and beams with memories he longs to share—of food. Maher traces his love of food to his childhood. Both his mother and his grandmother cooked well. At age six, Maher started helping them in the kitchen on the cook’s day off. During summers spent east of Alexandria in Aboukir, he remembers that his family would buy fresh gray mullet (bouri) directly from the fishermen at the dock and take them to a local bakery to cook. The whole, wet, ungutted fish would first be smothered in wheat chaff to keep it from drying out, then thrown directly onto hot coals. Once well blackened, the fish was dipped in saltwater. Immediately, Maher and his family would eagerly peel away the blackened crust and skin to eat the soft, white flesh within. Maher also remembers eating fresh blue crabs dropped into a pot of heated water to which generous handfuls of onions and cayenne peppers had been added. Fishmongers would come to his grandmother’s house with baskets of fresh sea urchins. While Maher watched, the fishermen would cut open the tops of each spiny urchin to reveal the yellow, caviar-like roe within. Even such simple chores as clarifying butter launch Maher into intense food reveries. In the mid-1960’s, Maher’s family left Alexandria for Toronto, and they recreated Egyptian dishes with the ingredients they found in their new home. He recalls his mother’s delight when she discovered that an Egyptian neighbor grew fresh molokhia (mallow), a favorite dish. Otherwise, fresh vegetables were hard to find in the Canada of the 1960’s: Vegetables, he says, were a frozen food by definition. While his brother Peter went to medical school in Egypt and second brother, George, went to medical school in Egypt and Canada, Maher found two years of pre-med studies to be enough. In his third year, he tried liberal arts, including an acting class. During his very first rehearsal, he turned to his director and said, “I’m going to be doing this for the rest of my life.” After he finished at the University of Toronto, his new-found passion drove him to New York in 1978. There he attended the Neighborhood Playhouse School of the Theatre in mid-Manhattan, alma mater of Gregory Peck, Al Pacino, and Diane Keaton, as well as of director Sidney Pollack. Like most starving actors, Maher also worked as a waiter, in his case in no less prominent a place than Tavern on the Green in New York’s Central Park. But instead of staying in the front of the house, Maher was drawn to the kitchen, where he helped the garde-manger chefs prepare vegetables and make cold salads. At Tavern on the Green, he met restaurateur-to-be Drew Nieporent, who guided Maher-the-foodie through the intricacies of a first-rate professional kitchen, while Nieporent’s mother helped Maher-the-actor get his first talent agent. Otherwise completely self-taught, Maher began catering at people’s homes until he landed his first major acting role: a year’s stint as the evil assassin Colonel Hashim on the soap opera Another World. In 1982 Maher moved to Los Angeles to pursue motion-picture roles. He changed his name from Maher Boutros to Christopher Maher, but despite the change he was offered only evil-Arab roles. To support himself while holding out for better roles, Maher returned to catering. 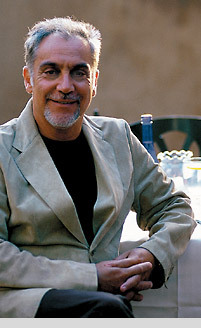 By 1990 he had founded Christopher Michael’s catering, the name reflecting a short-term partnership with Michael Toolin. The catering business thrived, and Maher added a bakery and a café. Eventually, he moved all these, along with a new fine-dining restaurant, into the Pacific Design Center in West Hollywood and received favorable reviews in The Los Angeles Times. Maher was invited by Creative Artists Agency agent Fred Spektor to teach Saturday-morning cooking classes to actors and producers at Spektor’s home. Bill Gerber, a music and film talent agent who headed Warner Brothers and then formed his own production company, was one of Maher’s students. Gerber became a regular at the weekly cooking classes. “The reason we went so often,” Gerber says, “is because Chris’s personality is very soothing and he enjoys life so much, eating and entertaining. You feel you’re in a salon, and you’re with someone who appreciates friends and the finer things in life.” Gerber and Spektor even threw a party for the launch of Maher’s bakery. Yet with all his powerful friends in “the business,” Maher never asked for help in getting good roles—indeed, he never told his cooking students he was an actor. He kept his cooking and his acting completely separate. In the early 1990’s, Maher joined the numbers of Hollywood people who vacationed in Taos, New Mexico, and he eventually built a vacation home there. Then, in 1998, he got a call that an old restaurant in Taos was up for sale. Time was short; a quick decision had to be made. Maher decided to go for it. He managed to sell his bakery and cafe and his house in Los Angeles, all at a profit, and bought the dilapidated restaurant. It was the single largest financial transaction of his life, with amounts in eight digits—a long way from buying bouri from fishermen in Alexandria. As he restored the Taos restaurant, he shuttered his catering business and finally opened Momentitos de la Vida in January 1999. Maher has by no means quit acting. He travels to Los Angeles a few times a year for television guest appearances or to try out for a film. After 9/11, he found a number of more interesting and less stereotypical Arab roles. Besides Enough, in which he played an Arab cook and restaurant owner, he has appeared on Fox’s 24, playing a deputy prime minister, and twice on CBS’s The Agency. The challenge in Los Angeles is to find more “good” Arab roles. The challenge in Taos is to keep the restaurant at the level of excellence Maher demands even when he is not there. With no shortage of young chefs who adore the Taos ski slopes as much as Maher’s kitchen, the Taos challenge is the easier one. Camera opens on elegant restaurant on Alexandria’s newly expanded corniche. Lines of cars roll up to deposit excited diners. Camera follows one family inside, where CHEF/restaurateur [Christopher Maher] greets them with warm, familiar salutations. CHEF sends diners off to their table and waiters to kitchen to return with long trays of mezze à la Maher—Egyptian and Californian appetizers. Close-up on CHEF smiling—at both past and present. How far off is this script? As we taste his mezze, his steak, his risotto, clearly there is something about the spicing, about the boldness of flavors and about the presentation, that is Egyptian. Maybe this script is not too far off.